Have you ever had the urge to fly? Udayakantha Warnasooriya's Aasai Mang Piyambanna is the next movie to take on the wide screen at Savoy and other E.A.P. cinemas island wide from November 2. The film included Dts sound and the cinemascope technique and is produced by Dammika Siriwardena for Alankuam films. With 12 successful films like Maha Mera Usata, Gini Avi Saha Gini Keli, Bahu Bharya, Raajya Sevaya Pinisai, Le Kiri Kandulu, Hiripoda Wessa and Ran Kevita, already under his belt let us ask Warnasooriya what his newest cinematic creation is all about. How would you classify your new film? This is a musical entertainment movie. What is the story behind Aasai Mang Piyambanna? It relates how a young girl who came from the village undergoes changes and achieves fame in the city. It is a tale of love, realisation and humanity woven together with music, dance and song. It is not a rejection or acceptance of the essence of city life. It merely states that one should choose humanity as the guidance of life. Is it true that this tale is adapted from a popular Hindi movie? Yes, some elements have been borrowed but the story had been reconstructed to suit the Sri Lankan context. This is a new trend which is increasingly becoming popular today. It is not easy to adapt these values. You need a lot of money and resources. The movie features scenes from our traditional dances. There are a lot of elements which are unsuitable for our context in the Indian cinema. I have made the necessary alterations to suite our audience. Why did you decide on Pooja for the main role? Since the story evolved from Indian roots it seemed suitable to choose someone like Pooja, an actress who is both Sri Lankan and Indian to play the lead. She was most suited for the role. What about the role played by Sanath Gunatilleke? That is a very advanced character, a character which I realised that an amateur would not be able to portray. I wanted to create a difference. Therefore he had to be transformed to a youthful character around 35 years of age. Roshan is one of the leading young actors in the industry today. His appearance fitted well with Pooja and I have found it easy to work with him since his debut to the cinema in Hiripoda Wessa. Why did you title name the film as Aasai Mang Piyambanna? It reflects the hopes of the people, especially the three main characters. Some possess hopes, which can be achieved but others do not. That is the reality of life. What will succeed Aasai Mang Piyambanna? I have already got an idea to do a creation with the family theme in mind. I hope to start work on that by the end of this year. I wish to do an action film as well. Therefore whatever follows this film will surely be different from all my previous creations. It was one great string quartet from the beginning to the end. It was of three parts - Gaiety, Despair, and Love, instead of the usual four of the classical string quartet. Further, the parts were composed over a period of 200 years - by Haydn in 1797, Joerg Widmann in 1997 and Schumann in 1842. 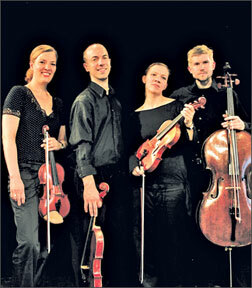 A chamber music concert was given by the internationally acclaimed Signum Quartett, a group of four young string players from Germany - Kerstin Dill (violin), Annette Walther (violin), Simon Tandree (viola) and Thomas Schmitz (cello), on Sunday, September 23 at the Auditorium of the British School in Colombo. It was presented by the Goethe - Institut, Colombo to mark its 50th anniversary in Sri Lanka. It provided an excellent opportunity to Sri Lankan music lovers to listen to a live performance of chamber music - string quartets by classical, romantic and modern composers. The concert commenced with Joseph Haydn's string quartet in D major, op. 76. No.5. This work, which was composed in 1797, is one of the late quartets of Haydn, who is considered to be the father of the string quartet. The Signum Quartett's rendition of this through and through classical masterpiece was simply brilliant. It made me feel somewhat guilty - Have we more or less neglected Haydn's muse for no fault of his ? The ensemble cheerfully brought to life the gaiety, innocent humour, sheer euphony, classical form and balance of the work. What I would remember most is the slow second movement - Largo ma non troppo; cantabile e mesto and the last movement, Presto. The slow movement was a delightful blend of sensuous sound and spiritual depth. The influence of the folk element was clearly evident in the Presto. The Haydn work was followed by the String Quartet No. 1 by the young German composer and clarinet virtuoso Joerg Widmann. The Widmann work, a through and through piece of modern music, was utterly different to the cheery Haydn quartet. We were taken to a world of strange sounds, exotic rhythms and moments of silence. Outwardly the music sounded cerebral. However, it was by no means lacking in expression, excitement and emotions. Even the elements of spirituality and sensuousness were present to some degree. However, there wasn't an iota of flowing melody, sweet harmony, classical form and balance in the Widmann work. Widmann seems to have questioned the very foundation of Haydn's music. The questions - Is Haydn's music too pleasing to the ear to be real? or " should music necessarily be sweet in order to be music?" Widmann was followed, after a short break, by the last work of the evening's programme - Robert Schumann's string quartet in A -major, op 41 No. 3. We were back in the world of sweet concordant sound. As Simon Tandree (viola) explained, it was a love - song.